To understand the importance of the current Sahaja Yoga tour in Sierra Leone, which is taking place from 5 March to 5 April 2008, it is necessary to find out a little about the history of Sahaja Yoga in Sierra Leone. Sometime in the early 1980s, an Australian Sahaja yogi called Peter Corden was working in Sierra Leone, in Africa, on the refurbishment of the Sierra Rutile Mine. During this time, Peter was working with a Sierra Leonean, and the two became close friends. The man, whose English name was Patrick Sheriff, started practising Sahaja Yoga. Peter left Sierra Leone in 1986, and for some time kept in close contact with Patrick. 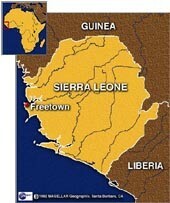 However, in 1992 war started in Sierra Leone, and tens of thousands of people died. Peter lost contact with Patrick, and feared for the safety of Patrick and his family. In late 2006, while shopping in Toowoomba, Australia, Peter saw an African lady whom he recognised as coming from Sierra Leone. He spoke with her, and through her was eventually able to find out that Patrick was still alive. In July 2007 after eighteen years, Peter was able to speak with Patrick by telephone! Peter discovered, after all this time, that Patrick was still practising Sahaja Yoga. Out of this amazing event came Peter’s desire to travel once more to Sierra Leone, this time to help organise a Sahaja Yoga tour. With Freetown as the centre, the tour organisers hope to contact as many people as possible to spread the message of Sahaja Yoga. Starting with a one-hour television talkback session on ABC TV in Freetown, the station has continued to provide daily, 45-minute sessions on Sahaja Yoga. Sahaja Yoga is mentioned four times a day on radio. Hundreds of people are coming to meditation sessions at the beach each morning. Musical programs are also being held. To celebrate the 85th Birthday of Shri Mataji, the founder of Sahaja Yoga, on 21 March 2008, ABC TV broadcast a 30-minute segment showing Shri Mataji giving realisation. As ABC TV has approximately one million viewers, the program was able to reach many, many people. In 1986 Shri Mataji replied when questioned, ” What is Sierra Leone?”, “It is a Ductless Gland, a Remote Control,” came the answer. In 1985 the Remotre Control was given a “small press” and after 22 1/2 years and much turmoil in the country a “second pressing” has been applied which may be 100 times more or 1000 times more than the initial pressing. If we study the term Ductless Gland within the context of the body we will find that anything happening at such a gland will have ramifications for the whole body. Rutile is Titanium Dioxide and found in various places around Sierra Leone. This mineral has a tetragonal crystaline form of 3 parallel lines of which one is longer. March 9th 2008 the Tour started with a Mahashivatri Puja. May our truth be wrapped in a beautiful flower of love when given!